Guldgubber are small gold-foil figures. They are between 0,5 cm to 1,5 cm high and vary in wideness. They are very thin – about a millimeter thick – and made of a gold alloy, mostly mixed with copper, which can be seen by the red colour and the red spots that sometimes appear on the guldgubber. 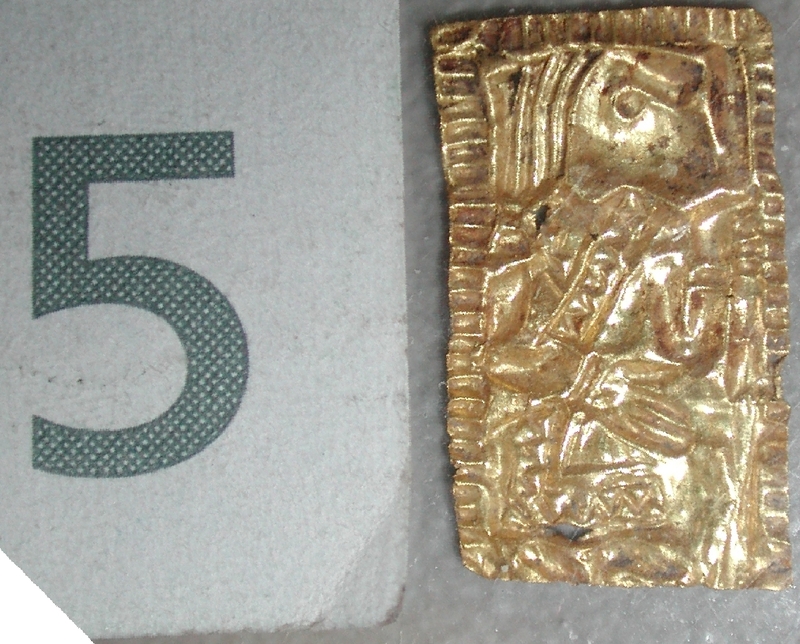 Guldgubber were found and recorded for the first time 1869 by E. Vedel in Sorte Muld (Bornholm/Denmark), but Sorte Muld was already known for gold-foil figures since 1569. Guldgubber are found in whole Scandinavia, but not elsewhere like Brakteats. A distribution of finds can be found under archaeology and finds. Guldgubber are hard to date as they cannot be dated themselves and other dateable surrounding finds are rare. At some places, however – Uppåkra for example – dateable material or soil layers are found and the Guldgubber were thereby dated to 400-800 a.d. (Early Iron Age).